In 1872, African Americans from Liberty County began another letter writing campaign; this time for a teacher to replace Eliza Ann Ward. They requested that their next teacher be both a teacher and a minister. In the spring of 1874, the community finally received news that the American Missionary Association (AMA) had hired Floyd Snelson as their new teacher and minister for the Midway Congregational Church. By the end of the 1874 school term, two hundred and seventy pupils had attended. The school had grown to be so large that nearly sixty students were instructed outside the classroom. In September of 1877, Snelson was sent to Africa as a missionary by the AMA. When he returned, he resumed his position as minister but not as principal because the AMA had decided that the job now required a full-time employee. 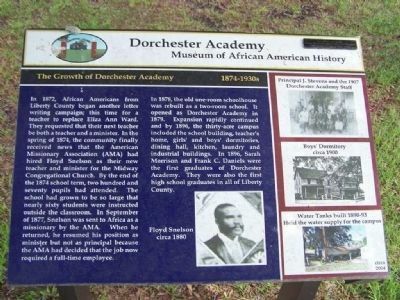 and Frank C. Daniels were the first graduates of Dorchester Academy. They were also the first high school graduates in all of Liberty County. Location. 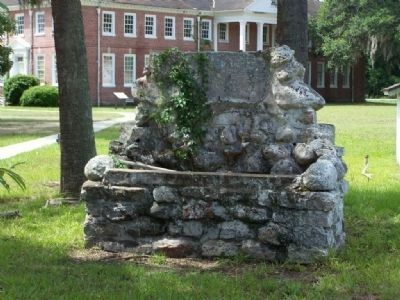 31° 48.076′ N, 81° 27.895′ W. Marker is in Midway, Georgia, in Liberty County. Marker can be reached from 8787 East Oglethorpe Highway (U.S. 84) near Lewis Frasier Road. Touch for map. 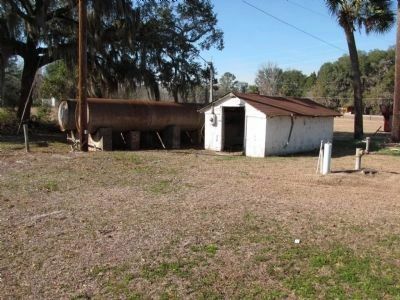 Marker is in this post office area: Midway GA 31320, United States of America. Touch for directions. 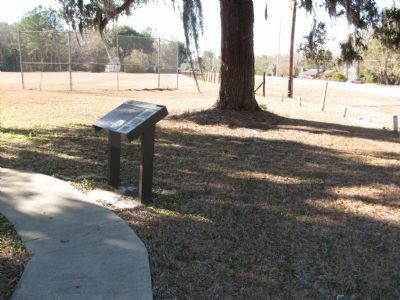 of this marker); Working Together at the Dorchester Cooperative Center 1930s-1940s (within shouting distance of this marker); The Story of the "Bell" at Dorchester Academy (within shouting distance of this marker); Liberty County Citizen's Council 1946 - 1953 (within shouting distance of this marker). Touch for a list and map of all markers in Midway. From near the Dorchester Academy 'entrance gates'. US-84 to the right. also shown in the lower right picture on the marker. More. 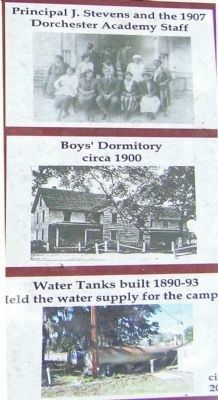 Search the internet for The Growth Of Dorchester Academy 1874 - 1930s. Credits. This page was last revised on June 16, 2016. This page originally submitted on July 9, 2008, by Mike Stroud of Bluffton, South Carolina. This page has been viewed 1,283 times since then and 6 times this year. Last updated on October 22, 2015, by Byron Hooks of Sandy Springs, Georgia. Photos: 1, 2. submitted on July 9, 2008, by Mike Stroud of Bluffton, South Carolina. 3. submitted on July 11, 2008, by Mike Stroud of Bluffton, South Carolina. 4, 5. submitted on April 15, 2011, by Lee Hattabaugh of Capshaw, Alabama. • Bill Pfingsten was the editor who published this page.